Petals World School Kaushambi celebrated Earth Day. Both the students & the teachers exchanged saplings among their staff, thus spreading the message of the greener environment. Post the activity the school also held sessions for students on how they should protect the environment and contribute towards building a sustainable ecosystem. 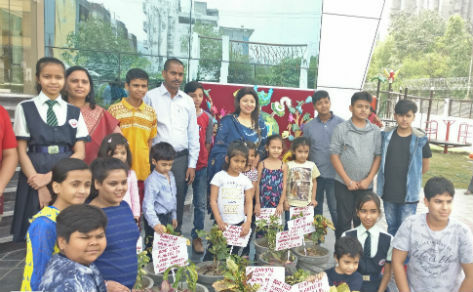 Shri Jeevan Kumar, Founder Petals World School & Founder Member Kamla Aggarwal Educational Society, Ms Preeti Kwatra Chairperson Petals Group of Schools and Ms Sudha Sivadas Principal Petals World School along with students were present during the occasion. Petals World School boasts of an Eco-friendly Infrastructure, Green Building, Water Recycle & Auditing System, Energy Auditing, Futuristic Approach to Education, Value-based Education system, Emphasis on Sports & Extra Curricular activity that are the key attributes of any progressive institution.